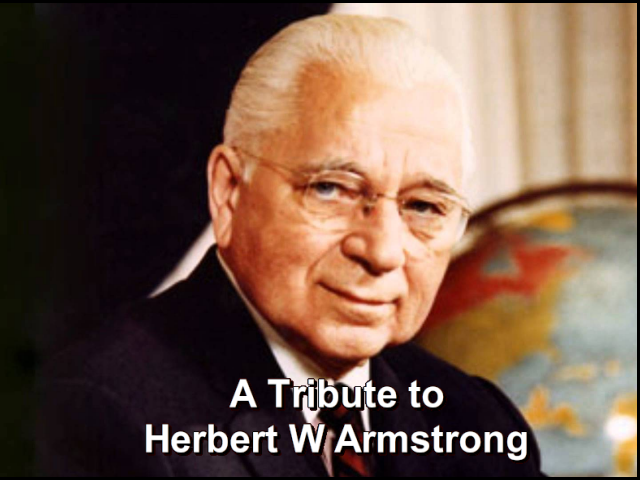 Herbert W. Armstrong died peacefully in his home at Pasadena, California, on the morning of January 16, 1986. He was in his 94th year. In this special program, we review the life and work of Mr. Armstrong, for over 50 years, the voice of the World Tomorrow. The World Tomorrow, with Herbert W. Armstrong, has always been a unique program, showing the relevance of the word of God to today's turbulent society. It explains the real cause of the troubles of this world, and the promise revealed in the Bible of a better world tomorrow. For over 50 years, Mr. Armstrong delivered this message of hope on television and radio stations around the world. The World Tomorrow program is seen and heard on over 350 stations throughout the United States, Canada, Europe, Australia, Asia, and the Caribbean Islands. Subtitled versions of the program can be seen in France, Canada, Italy, and Scandinavia. It is planned to make the program available in several other languages. Herbert W. Armstrong was one of the pioneers of religious broadcasting. His voice was first heard on the air in 1933, when he was offered 15 minutes of airtime on Station KORE, then broadcasting with only 100 watts to the towns and villages of the Willamette Valley in Oregon. In later years, Mr. Armstrong would often reminisce about his early experiences in broadcasting. "Then, in October 1933, I had an opportunity to go on the local radio station five mornings, for 15 minutes. It was free time, and they couldn't get ministers in local churches to take the time, and so I was able to get it, and of course I didn't have to pay for it. Now that led to the Radio Church. There was quite a lot of mail coming in, and the manager of the station asked me then to start a regular Sunday program, and so the church went on the air, and I did the speaking." "On the first Sunday in 1934, we went on Sunday morning at 10:00, and the cost was two dollars and a half a week, and I only had the money pledged from the brethren for a dollar and a quarter a week. And I had to take the rest of it on faith. That was the beginning of the (what we call then the) Radio Church of God. February 1st, the Plain Truth came out with its first issue, mimeographed; only about 350 copies were made." Although Mr. Armstrong did not realize it then, those first broadcasts and the mimeographed copies of the Plain Truth magazine were the beginning of what was to become a worldwide work, to fulfill the great commission that Jesus Christ gave his church. Mr. Armstrong himself wrote in his autobiography: "At last, in the light of fast-developing world-encircling events, it became apparent what was actually happening back in 1934 was precisely this — Jesus Christ was opening the gigantic mass-media door of radio and the printing press for the proclaiming of his same original gospel to all the world." "Today, my friends, we are in the time as foretold by Jesus, when he said that this is the beginning of sorrows, just the beginning of trouble and of sorrows in the world today. And so again today, my friends, I want you to notice first Jesus' Olivet prophecy found in the 24th chapter of the book of Matthew. Matthew 24...."
It was a small and humble beginning, but like the proverbial grain of mustard seed, the Work was destined to grow. By 1944, the World Tomorrow radio program could be heard throughout the United States. In 1953, it went on the most powerful station on Earth at that time — Radio Luxembourg, broadcasting to the British Isles and the continent of Europe. The World Tomorrow first became a television program in 1955, when television was a relatively new medium. "The World Tomorrow.... broadcaster and editor, Herbert W. Armstrong, reveals the startling significance behind today's world troubles, with the prophecies of the World Tomorrow when wild animals shall be tamed — a lion and a lamb, playing together, and a little child leading them, in a world of peace at last. Ladies and Gentlemen: Mr. Armstrong." "Well, greetings, friends! The real significance behind today's world disturbances is simply this: that we're now near world peace, believe it or not!" Later, Mr. Armstrong was to make many telecasts from the studio of the World Tomorrow in Pasadena, powerfully proclaiming the gospel of Jesus Christ. "If Jesus Christ was here today, he would preach the same thing that you hear me preach! Look into your Bible, don't believe me! Look into your own Bible, and you'll see that everything that I'm telling you comes right out of the Bible. It is God speaking, and it is the very message of God." As the World Tomorrow program began to be heard worldwide, the Plain Truth circulation also began to grow, first in thousands, and then in millions. The Plain Truth is unique among the world's mass circulation magazines, carefully analyzing the real meaning behind the news of the day, foretelling trends in world events with an accuracy that is based on the prophecies of the Bible. New languages were added over the years: German, French, Spanish, Dutch, Italian, and Norwegian. Today, the Plain Truth has a circulation of eight million, with readers in nearly every country on Earth. Mr. Armstrong remained active as editor-in-chief until the end of his life. He was present at the printing plant of R.R. Donnelly in Glasgow, Kentucky when the 50th anniversary edition of the Plain Truth rolled off the presses. This 50th anniversary edition is still sent as an introductory copy to all new subscribers. In 1967, a remarkable door was opened for Mr. Armstrong to begin to reach some of the most important and influential men and women in the world. For almost 20 years, Mr. Armstrong traveled thousands of miles, meeting with kings, emperors, presidents, prime ministers, and leaders of many nations. The walls of his study are lined with mementos of those visits, gifts from the leaders of nations great and small. "I probably have visited more heads of government in their own offices than any other man. What do I talk about? I talk about the conditions that they're confronted with. I talk about world conditions and problems, problems that are far greater than they themselves are able to cope with. I talk about the cause of these conditions. I go as an ambassador, an unofficial ambassador for world peace, and they receive me as an ambassador for world peace. But I have to tell them why we don't have peace. I have to show them how peace is going to come, and why we don't have it. And you know, that makes sense to heads of state. They're practical men. They see these things about them all the time, and they begin to listen when I talk about those things. Do I talk about the kingdom of God? Yes, I do. And God is going to intervene, and sometimes I tell them that straight out." "They have called me an unofficial ambassador for world peace, and so I am. But let me say that there has to be a reason why we don't have peace. And you cannot have peace until there is something that will cause that peace. And there has to be a reason why something has caused us to have just the opposite of peace in this world today. And I'm afraid so many don't understand that. Now in the world today, there are many different ideologies and philosophies and religions, and everybody seems to think that their own, of course, is the right one, and the only one that is true and correct. And I did not come to bring any religion or philosophy or ideology, but just to state a few facts that are facts. We do not have peace, and will not have peace, until human nature has been changed." Mr. Armstrong was able to view the 20th century from a unique perspective. In his long life, he saw the coming of the inventions that made possible this modern age: the airplane, radio, and television, the computer, and space travel — inventions that had changed our world, but not our thinking. In August 1914, Europe erupted in war. For four terrible years, the great powers battled each other, until they reached a standstill in the fields of France and Belgium. When the conflict was over, and the armistice signed, a generation of young men had been slaughtered. The world was sobered. Weapons had become so powerful, the destruction so complete — surely civilization could not survive another war like this. This had to be the War to End All Wars. Following the armistice, King Albert I of Belgium visited a battlefield in his shattered kingdom. Appalled by the scenes of ruin and slaughter, the king ordered an iron shell casing found on the battlefield to be cast into four watchcases. He intended to present the watches to the four individuals who he felt had made the most significant contribution to peace. One watch went to Field Marshal Ferdinand Foch, head of the Allied Supreme Command. Another was given to General John Jake Pershing, commander-in-chief of the American Expeditionary Force. The third watch was presented to France's Premier, Georges Clemenceau, for his inspiring leadership in the dark days of war. But King Albert did not find anyone qualified to receive the fourth watch. When King Albert died, it was passed to his son, King Leopold III. In 1970, half a century after the end of World War I, King Leopold presented this fourth watch to Herbert W. Armstrong. In accepting it, Mr. Armstrong said, "I feel it was the highest honor that king could have paid anyone. Whatever contribution to world peace I may be making is not through war, but through education, teaching millions worldwide the way to peace." "The world has tried everything that man can conceive of for world peace. They have worked for world peace, they have fought for world peace, they have striven for world peace, but nothing has brought world peace. World War I was supposed to be the war that would end all wars. It didn't end wars. Then came World War II, and it was labeled as the war to end all wars. But as a matter of fact, more than 140 wars have occurred since the end of World War II. This book, the Holy Bible, says that the way of peace they know not. But men do not know the way to world peace. There has to be a cause for everything that has happened." In these last decades of the 20th century, many philosophers, commentators, and newscasters see that the problems of the world have reached a crisis point. Many leaders have recognized that we may indeed be approaching Armageddon. Mr. Armstrong, through his understanding of Biblical prophecy, grasped the true significance of these times. He has been a voice of sanity in the decades of confusion. "A staggering turn in world events is soon going to erupt, that will astound the whole world. As a matter of fact, two absolutely unthinkable world events are going to occur in the approximate future. First, the unthinkable nuclear World War III that could wipe every man, woman, and child off the face of this Earth, annihilate all civilization, is definitely going to come. But it will be stopped before any such fate finally happens. And then, just as unthinkable, is world peace, an absolute utopia on Earth, and that too is definitely going to happen in the approximate future." "The world is asleep. The world doesn't know what is about to strike. The world is going on as if things are going to continue just as they are. And I am warning you, they will not. There is only one authority that can tell us what is going to happen, that can give us the cause of what has happened and what will happen, so far as that is concerned, and that is the book we call the Holy Bible, and its prophecies." This is the commission that Jesus Christ gave to his church, to preach the gospel of the kingdom to all the world before the end of the age, and the establishment of the kingdom of God, the coming time of world peace and happiness that Mr. Armstrong called the World Tomorrow. That World Tomorrow is not here yet, and so the Work that God began through Herbert Armstrong will go on. This program will continue, and the Plain Truth magazine will continue as they have since 1934 — dynamic, up-to-date, giving people around the world understanding with hope and reassurance of a better world tomorrow. Before his death, Mr. Armstrong appointed his deputy, Joseph W. Tkach, to succeed him as Pastor General of the Worldwide Church of God. On the morning of January 16, Mr. Tkach addressed the employees of the church assembled in the Ambassador Auditorium in Pasadena: "This undoubtedly is one of the most sobering occasions that we will experience in a lifetime. I'm sure we all dearly loved Mr. Armstrong. We are a product of his dedication and his service for all of these years, especially the last 53 years that he has dedicated himself to serving the great living God." "This is not a time, although it is sobering, but not a time for great grief, as those who are without knowledge or understanding, the purpose of life and death. But we can rejoice knowing that Mr. Armstrong died in the faith, doing the Work that God has called him to accomplish. Even in the last year of his life, with declining strength, he completed probably the greatest work that he has accomplished, in the book The Mystery of the Ages." Mystery of the Ages was originally written for the students at Ambassador College. In August 1985, Mr. Armstrong personally presented the new book to the students of the Fundamentals of Theology class. It would be prove to be one of the last times he would speak in public. "When the Bible speaks, that is God speaking, not a man. Now it's true, Moses wrote the first five books, but it wasn't really Moses writing it. God was having him write it, and it was God writing it. But that was really inspired. And then when we come to prophets like Isaiah, Jeremiah, Ezekiel, then when we come to the New Testament books, God inspired them. They are the infallible words of God. This book is not. I don't make any such claim for this book whatsoever." "But I think in a way God inspired it, but not in a sense that it is the word of God. It's as God inspired Herbert Armstrong, and I tried to yield myself to him, and I hope I was able to yield myself, if not 100%, 97 or 98 or 99%. The Bible is like a book that had been sort of cut up into about 2,000 or 3,000 pieces, and you have to get them all put together in the right order, or you can't understand them. This book puts them together, and yet this book is only a synopsis." "You could say it's the gist of the Bible, the synopsis. It doesn't cover all of it. But it covers the main thread of the Bible, so you can understand the Bible and understand the other details when you read them in the Bible. It'll open up the Bible so you understand it. That's what it is for — make the Bible plain and clear and understandable, and God is such a great God when you come to really know him, and who and what he is, and how real he is." "And I want to say that you need to read every word, and you need to go over it more than once. You aren't going to get the full meat of this book in one reading. This is a book that, after you've read it, you can read it a second time, and then later a third time. This book is not intended to take the place of the Bible; it's intended to make it so you will understand the Bible. You must read the Bible with it, and this is to make the Bible clear and understanding to you as you read it, and to bring its meaning out as you never saw it before." "And I hope it'll be a blessing to you. I hope you will enjoy it, it'll give you great happiness and enjoyment. I hope you'll enjoy reading it, and I hope more than any other book you've ever read, except the Bible. And perhaps in a sense, this makes even the Bible more clear and plain, and you'll enjoy the Bible more from now on. But you'll forgive me if I get a little bit of thrill that this was then done now [laughter], book was out now. Today is a pretty big day in my life, when I can hand copies of this book out to each of you." And now, in this special tribute to Herbert W. Armstrong, we are pleased to offer a free copy of Mystery of the Ages to our viewers. Time may prove Mystery of the Ages to be one of the most significant books ever written. There is a great paradox in our world today. In this 20th century, we have made incredible progress in nearly every field of knowledge: science, technology, medicine, transportation. But in spite of this progress, we still live in a world of appalling evils and suffering, famine, poverty, sickness, and war. Why is it, when knowledge is exploding, do we still not know the answers to the most fundamental questions? What is man? Why was he created? What is the purpose for human life, or even is there a purpose? Over 60 years ago, Herbert W. Armstrong was challenged to make an in-depth study of the Bible. He began to see that this book so often misunderstood, did indeed contain answers. Over the years, he continued to study, developing a unique understanding of the questions that have always perplexed mankind. Mystery of the Ages is the product of that understanding, a labor of love written in the last year of Mr. Armstrong's long and productive life. Mystery of the Ages will help you understand. Each chapter will give you the keys to solving some of the most perplexing questions that have puzzles scholars and philosophers for thousands of years. You will see that the answers have been there all the time, hidden in the pages of the Bible. Mystery of the Ages will help you understand your Bible as never before. Who is God? What is he like? What is the truth about angels and evil spirits? Did God create a devil? And then, one of the greatest mysteries of all time — what is man, and how did he come to be on the Earth? Did he evolve or was he created? And if he was created, why? What is the purpose of his existence? Or, is there indeed any purpose? How did this world come to be the way it is? Are wars, famines, disasters, and poverty inevitable, or is there a fundamental reason why things are going wrong? What is the church? Why are there so many different religions, all claiming to be true? How can you tell if a church is right or not? Or does it even matter? Finally, the mystery of the kingdom of God — what is it? Is it in heaven, or on the Earth? Or is it, as some believe, set up in our hearts when we accept Christ? Mr. Armstrong devoted his life to understanding these mysteries. He wrote Mystery of the Ages to share that understanding with others. In this special tribute to his life and work, we would like to offer Mystery of the Ages to all our viewers. For your free copy, write to the World Tomorrow, Pasadena, California, 91123. That's the World Tomorrow, Pasadena, California, 91123. Or better still, call toll-free 1-800-423-4444. Hundreds of operators are standing by to take your call, but if the lines are busy, please try again. Call now — 1-800-423-4444 — and request your free copy of Mystery of the Ages. If you are not already a subscriber, also request a free year's subscription to the Plain Truth, a magazine of understanding. We invite you to join over eight million readers worldwide in learning the real significance of the times in which we live, through the pages of the Plain Truth. It's published in seven different languages. It's in full color. There's no magazine like the Plain Truth. It analyzes world news that is happening today, but in the light of Bible prophecy. It explains where world events are leading, and what is going to happen. Also, it talks about family life and contains articles of human interest. It is highly illustrated. There's no advertising, and no subscription price. That's the Plain Truth magazine. Tune in again next week at this time to the World Tomorrow.